Discussion in 'Delphi' started by Clericuzio, Mar 21, 2009. I think it's time to start thread with all Delphi Lite versions (all in one place). If you want to post more Delphi Lite, please do it here. For programmers: Don't be idiot - don't use cracked components or libraries. You never can't be sure what DarkCriminaLs put inside. 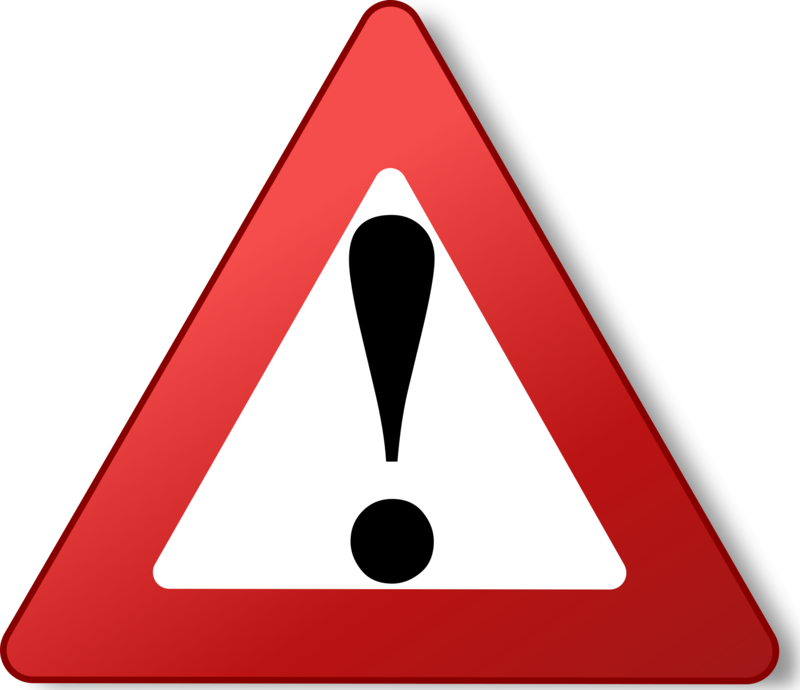 Use only source codes or retail binaries from trusted providers. And do not be a hypocrite, saying it was 'for test purposes only'. If you are doing it commercially, then stop, go and buy. Simple. Qba_Dev, stamen, zhyyt and 88 others like this. I am using Delphi 7 Lite For a While, and it is Awsome. stamen, Jeo Oliveira, gene king and 57 others like this. stamen, Jeo Oliveira, dalves125 and 56 others like this. How update old version for this version no deleting 3d party vcl component? Tools->Enviroment Options->Library. I then copy the stuff from the edit next to "Library Path" and paste it to notepad then save it. 1: Backup your .BPL folder just in case. 2: Run Regedit and find "HKEY_CURRENT_USER\Software\Borland\Delphi\7.0\Known Packages" and export it. 3: If requuired also export "HKEY_CURRENT_USER\Software\Borland\Delphi\7.0\Known IDE Packages"
4: UnInstall old lite version. You will be prompted to delete old folders, do not do this just keep them. 5: Install latest lite version, including CLX and version 1.0 compatibality if needed. 6: once installed close installer without running delphi, then double click the exported reg files to reinstall the 3rd party components. Last thing is to copy the text from the library path file you 1st saved. Just paste it into the Library Path edit field. stamen, Cont, dalves125 and 52 others like this. stamen, dalves125, jfbatista and 39 others like this. stamen, dalves125, jfbatista and 32 others like this. stamen, Cont, dalves125 and 37 others like this. 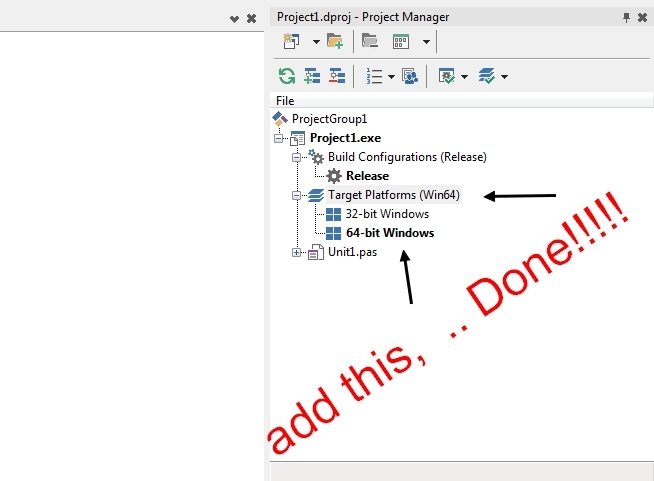 Rename the project file "Project1.dproj" for a later using or simply delete it. Now open the project file "Project1.dpk" and the file "Project1.dproj" is created with the default settings. It should now be possible to add the 64-bit platform and the switching between the platforms should also work as expected. In case this doesn't work, restart Delphi and try again. In case it's again not working, then it's diffcult to say what's goind wrong. Maybe the Delphi Edition doesn't support the 64-bit platform. Maybe the underlying Dotnet stuff is malformed, because Delphi is using parts of the Dotnet compiling infrastructure. stamen, Carlos David Montellano, dalves125 and 32 others like this. pherody, stamen, Cont and 86 others like this. tiburon, pherody, stamen and 60 others like this. pherody, stamen, Cont and 62 others like this. jandz, 3nity, stamen and 87 others like this. stamen, Cont, thefireflash and 38 others like this. hi, help, XE10.1 support Windows XP or not? Officially it does NOT support XP. But you still can install it on XP. stamen, dalves125, jfbatista and 17 others like this. But you still can install it on XP. The Vendor of Windows XP has stopped the support two years ago. A lot of software is working on Windows XP, but is not tested anymore. 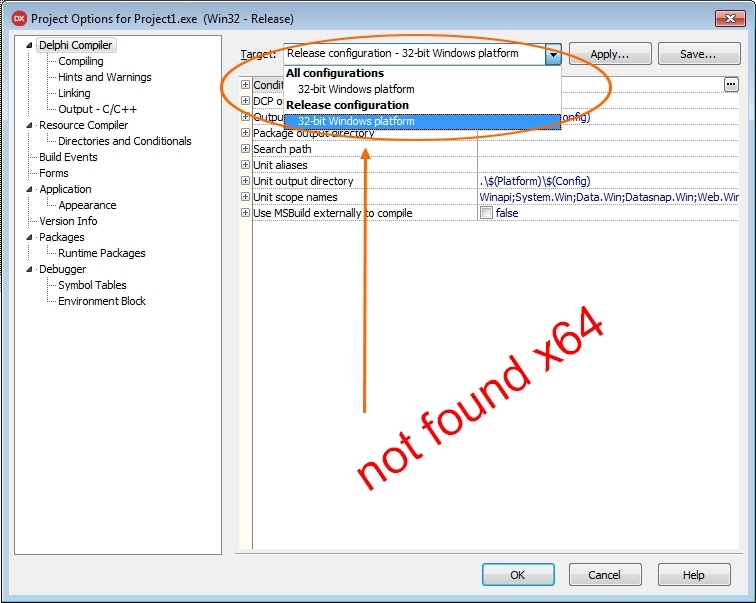 The Delphi IDE is probably working on Windows XP, but with exceptions, because the IDE is using certain Functions which are not available in Windows XP. It's should be still no problem to create software for Windows XP with Delphi 10.1 Berlin, but definitly not all Delphi components are working with Windows XP. stamen, dalves125, jfbatista and 18 others like this. leave an effect before you leave! stamen, Cont, pherody and 67 others like this. stamen, Cont, delphi63 and 88 others like this. stamen, Cont, dalves125 and 62 others like this. Cont, pherody, delphi63 and 64 others like this.